Next time you walk through your grocery store in search of healthy foods, don’t forget to grab a bar of dark chocolate. No, this isn’t a joke! According to researchers, eating about 1 or 2 ounces of organic dark chocolate every day could have major health benefits. It’s important to note we’re talking about dark chocolate here. More specifically, organic dark chocolate made of 70% or more raw cacao or cocoa content. This type of chocolate is far from a milk chocolate Hershey’s bar, which contains limited amounts of cacao. In search of that perfect bar of dark chocolate, you will notice the word “cacao” written on some of the packages. You’ll also notice other packages with the word “cocoa” written on it. While many people believe the two are the same (just spelled differently), that’s not the case. They’re actually slightly different. Cacao is a bean that grows on a cacao plant. Cacao is the rawest form of chocolate out there. It’s naturally high in antioxidants and is known to have health benefits. Cocoa is a term that is used for the cacao seed after it has been harvested. To put it simply, cocoa refers to the refined product of cacao. The higher the cacao or cocoa content, the healthier the chocolate. For a list of health benefits associated with eating dark chocolate, check out the following infographic (article continues below). 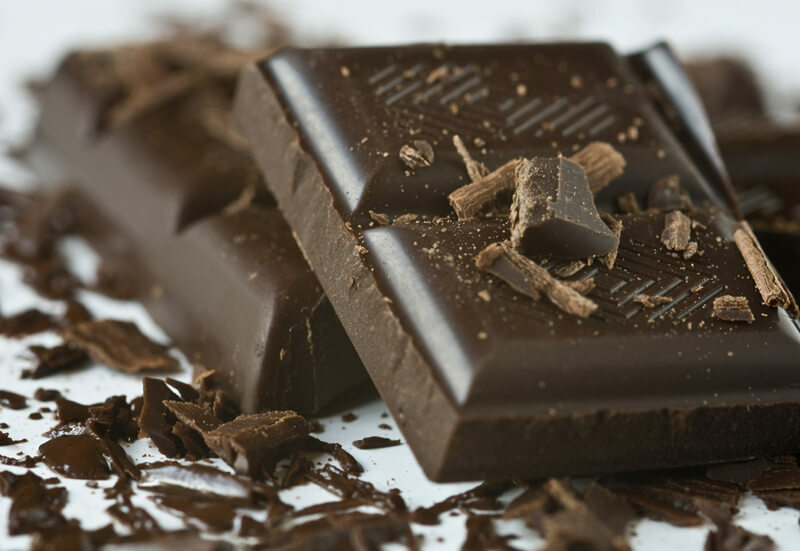 While dark chocolate contains key vitamins and minerals, researchers attribute its superfood status to our gut microbes. According to researchers, friendly gut bacteria break down and ferment the compounds in dark chocolate. This process creates anti-inflammatory effects, benefiting health. As mentioned in the above infographic, dark chocolate is a probiotic food. This means it promotes a healthier gut microbiome. A healthy gut has a positive impact on overall health. When biting into dark chocolate for the first time, you may be surprised by the taste. Rather than the sweet, sugary stuff you’re probably used to eating, cacao and cocoa can be quite bitter. For this reason, manufacturers sweeten the treat. While adding sweeteners to dark chocolate may please your taste buds, it does take away from the health benefits. If you’re looking to reap those potential health benefits, choose a dark chocolate that’s low in sugar. Also, when choosing a dark chocolate bar, go organic. This will ensure your chocolate is GMO free.